When we left off yesterday, the Fluffy Mullet of Doom was running rampant! Thank Helen something magical happened as the calendar rolled over to 2000! The update is unbelievable! The short hair works for his artist character (too busy painting and swooning to worry about his hair, and anything longer would get in the way of his epic canvases) and makes him look urban-cool in a way that really suits the film. The little sproingy bits in the front are more effective in the first picture than in the second and third, where they look more like...mascara? The next one isn't my favorite but it's cleaned up and somehow makes him look more Vinod-y than usual. And I can't quite believe I'm going to say this, but I think Bobby Deol has the better hair. That never happens. Gotta be honest: I have a hard time paying attention to the hair when the glasses are on, you know what I mean? But I like it! The bangs are fully there, unlike in Humraaz, and that's fine by me. Apparently in these two films (which I constantly get mixed up, by the way - I saw them almost back to back and they're very, very similar in my memory) you can tell who the bad guy is by how spidery his bangs are. 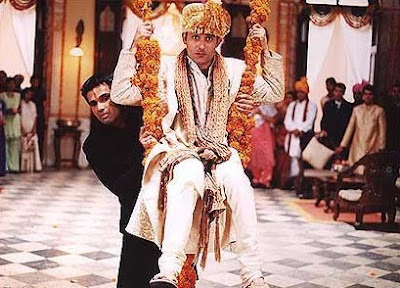 Since he's basically playing his movie-star self in a cameo, the return to the short hair of Dil Chahta Hai is a great choice - definitely the classiest, least fussy version of Akshaye in recent years. Maybe it's just a fluke of filming schedules, but I think it works. As an added bonus, this song ha some quality footage of Rahul Khanna doing a very fine wounded puppy dog look, warming up for his later career arc as the inexplicably jilted lover. Most notably, Hungama is this source of this image, which I adore. Short hair = good. Easy. Tidy. Never distracting from that delightful crinkly smile. It's one of the few things I like in this wackadoodle-run-amok movie. That and the Yellow Submarine-y typeface. Meh. It's growing out in kind of a bad way; fortunately, Kareena's hideous two-tone dye-job is so distracting that there are hardly any negative words left for Akshaye. This isn't related to hair, but I had somehow forgotten about the scene in which people decide it's a good idea to fling a groom through the air using a giant garland of marigolds as a slingshot. Tomorrow: lessons in going bald gracelessly and looking like a muppet. Please stick to the timeless short hair of Dil Chahta Hai. Beth's post makes an excellent case for it, as does FASHION IN GENERAL. I'm on the side of Ness and "Everyone in the Universe with Eyes." The short look is his greatest look. 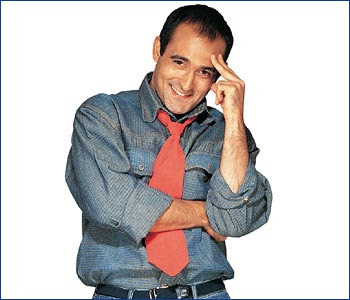 LoL, I hereby add my tick to the OPEN LETTER TO AKSHAYE KHANNA ^^,) And have to agree with @Myrna-nora and @Ness - the short look ROCKS! I gotta say, hair or no hair, I heart this dude. Agree with you and others about DCH being the best look. I gotta watch Deewaangee now. by popular demand: Khanna-o-Rama extended!